On July 16, 2016, I was scheduled to read at the annual Beast Crawl, a lit crawl event that spans three hours and dozens of venues in downtown Oakland. I was to read at the Bay Area Generations event alongside Clive Matson, a magnificent poet whom I’ve know for thirty years. Sadly, my health prevented me from attending — an expected 4-day hospital stay for surgery turned in an 18-day, complications-fueled ordeal — and I had to bow out. A good friend of mine, and no slouch at writing himself, Vince Donovan, read my work for me. Shortly afterward, I began receiving mysterious postcards in the mail. 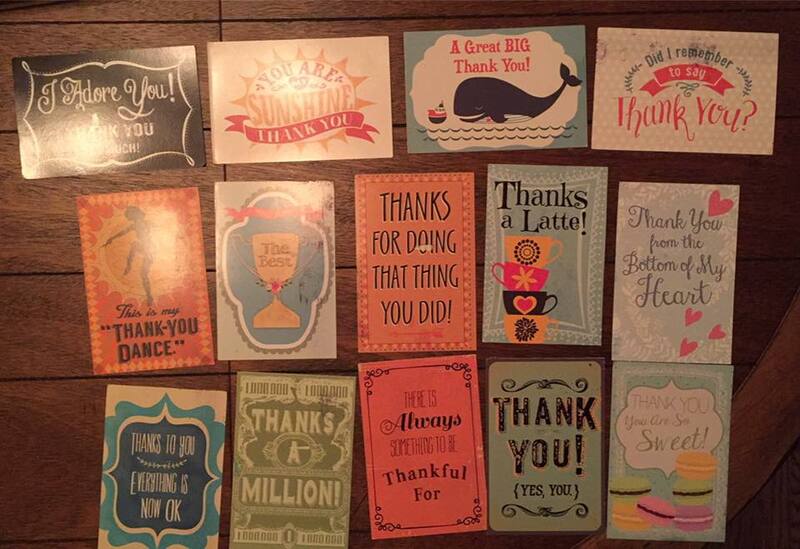 The graphic side all had a “Thank You” theme, and the different senders all composed haiku or positive messages on the back. I was mystified. Who were these people? How did they get my address? I finally learned that Amos White, a friend and fellow haiku poet, had handed out these postcards at the Beast Crawl event, encouraging attendees to send me haiku. How wonderful is that? The photo shows the first fourteen I received. A couple more have trickled in since, and I think more are still to come. Amos, Vince, Clive… You guys are the best. This is friendship. This is community.